Our Shortwave Service, Radio Australia! Reading the latest CQ magazine from our US friends brought to mind one unfathomable strategic decision Australia has made. Australia could well become irrelevant to nearby nations due to the focus on business principles rather than a service. The questionable savings of around $1.9M/yr as a justification without, according to the ABC article below, understanding the impact or consequences on our regional friends. Possibly, these ‘savings’ would not cover the cost of the ABC Board. Is it ignorance, arrogance or elitism that makes some believe the service is no longer relevant. Being a lucky and relatively wealthy country with good services predominantly in the privileged and populated coastal zones and cities, local decision makers appear unaffected by the realities of life in the remote areas of Australia and across the region. Australia has given away its voice in a rapidly changing environment where other interests will fill the void. The political parties all know, the ABC knows, we know but ….. . A review, reported by ABC below in June 2018 was that a review was planned. What has happened since. At least New Zealand has the maturity to maintain its services in the region. 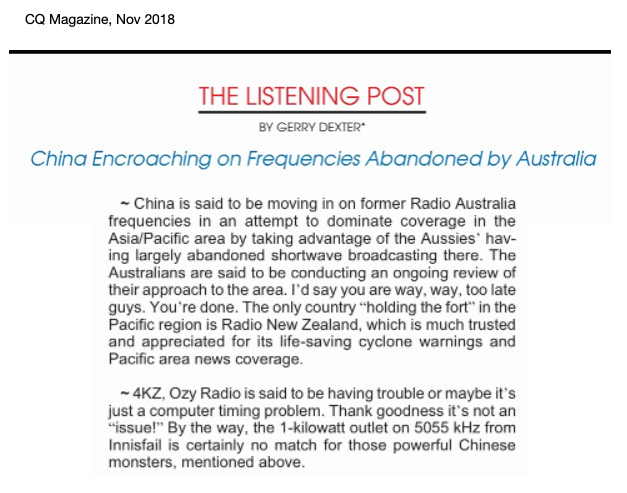 Chinese station has taken over some of the shortwave radio frequencies once used by the ABC in the Pacific region, following the broadcaster’s decision to end shortwave services. 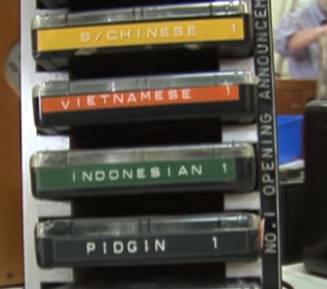 Killing shortwave disregards—disenfranchises—an unknown number of listeners. As broadcasting policy, it’s highly questionable. As strategy, it’s dumb—another bout of recurring Oz amnesia about its South Pacific role, responsibilities and history.